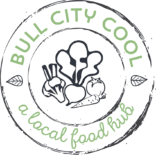 Our Bull City Cool Food Hub is located in Durham, NC, known as Bull City. The hub was both a community development project and an entrepreneurial venture that celebrated its grand opening in September 2015. Today Bull City Cool is a shared cool, cold and dry storage warehouse — as well as office space — where nonprofits and for-profits aggregate and distribute local farmers’ fresh food. Our goal is to strengthen Durham’s local food ecosystem by providing space and connections that benefit local farmers, food businesses and hunger-relief nonprofits. Download our brochure or visit our blog to learn more about how we support local farmers, build partnerships, and promote social justice.